New for 2017, the Smart Lock Pro from August converts your standard door lock in to an automaed lock in just minutes. Use the Smart Lock Pro with your smart phone, as part of a Zwave system or with Apple HomeKit. Share an electronic key with family, friends, housekeeprs or other workers any time and revoke access when needed. The Smart Lock Pro works with Siri, Amazon Alexa and Google Home for voice controlled automation. The DoorSense feature ensures that door has been closed as well as locked. So you'll know that the door is locked and secure. It can even remind you if you leave without closing the door. With the included WiFi connect bridge, users users can check the status of their door even if they're away from home. Simple DIY installation means that the August Smart Lock Pro can be installed inside the user’s door in about 10 minutes with just a screwdriver. The outside appearance of the door is not changed, making it great for condos, rental units, or those who wish to automate their lock without losing their high end door appearance. Smart Lock Pro is compatible with most single-cylinder deadbolts and lets users keep all existing hardware and keys while adding automation and convenience. 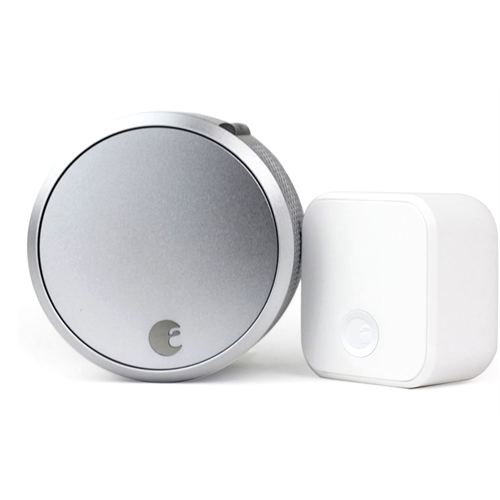 The package includes a Silver August Smart Lock Pro, August Connect Wi-Fi Bridge, DoorSense sensor, 4 AA batteries, lock adapter and mounting hardware.